Verron Ulric Haynes (/vəˈrɒn/ və-RON; born February 17, 1979) is a Trinidadian-born former American football running back. 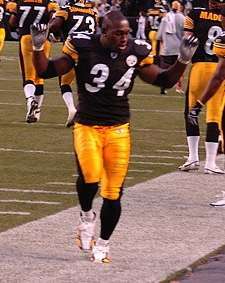 Verron Haynes was drafted by the Pittsburgh Steelers in the fifth round of the 2002 NFL Draft, following three successful college football seasons at The University of Georgia. With the Steelers, he won Super Bowl XL against the Seattle Seahawks. Verron appeared on the cover of Pittsburgh Magazine's 25 Most Beautiful People issue in January 2007. As of 2010, Haynes serves as an International commentator and television personality for ESPN International. Born in Trinidad and Tobago, before moving to New York City at age seven and then to Atlanta, Georgia, where he played high school football for North Springs High School. His father Ulric "Buggy" Haynes was a soccer player in the Trinidad and Tobago national team. In five seasons with the Steelers from 2002 to 2006, Haynes gained 660 yards on 159 carries (4.2 average per carry) and three touchdowns. He also recorded 39 receptions for 322 yards (8.3 average per reception) and two touchdowns, including one from wide receiver Antwaan Randle El. Haynes missed most of the 2006 season due to a knee injury. On March 1, 2007, he was cut by the Steelers in order to save cap room. However, he re-signed with the team on June 4, 2007. On September 1, 2007 he was released again. He was re-signed on December 24 when starting running back Willie Parker was placed on injured reserve. Haynes signed with the Atlanta Falcons on April 29, 2009. On December 5, 2009, he was released by the Falcons and re-signed on December 8. Haynes continues to be an active pillar in the community serving as a Board of Directors member for TurningPoint in Alpharetta, GA. TurningPoint is a non-profit Women's Healthcare organization that was established in 2003 in response to the unmet survivorship needs of women with breast cancer. He gives back to his homeland of Trinidad and Tobago though various Philanthropic efforts and the forming of The Red Sail Watersports company. In addition, Haynes splits his time between appearances, running The Verron Haynes Foundation, football clinics and camps and commentating for ESPN International. In an efforts to give back to the Youth and share his story, Verron Haynes is collaborating with a Fortune 500 company on a Philanthropic venture. ↑ Nero, Sean (2009-01-07). "Verron Haynes "The NFL chose me"". The Trinidad Guardian. Trinidad Publishing Company. Retrieved 2009-01-07. ↑ "Verron Haynes, Steelers Running Back, 2002-2007". Pittsburgh Sports Daily Bulletin. November 8, 2011. Retrieved March 25, 2014. ↑ Falcons sign former UGA running back, release Bergeron Archived May 2, 2009, at the Wayback Machine.